This is our basic service package for a simple beer and wine bar event. It includes full bar set up, service and clean up on site, purchase guidance and pairing, all bar equipment, tables, bar linens, ice, coolers, non alcoholic beverages, sparkling and still water and fresh garnishes. Our signature service includes a full bar set up, service and clean up on site, purchase guidance, signature copper barware bar tools, tables, linens, coolers, ice, non alcoholic mixers and, seasonal fresh juices, garnishes, syrups, shrubs, bitters, sparkling and still water, as well as cocktail ingredients for basic bar menu such as gin and tonic, old fashioned etc. Tired of waiting in Portlandia lines for brunch? Throw your own VIP brunch party! Just think, Bloody Mary/Maria Bars, Bellini Bars, Spritzer Bars, the options are endless! This service includes bar set up, service and clean up on site, purchase guidance, all professional bar equipment, tools, tables, bar linens, ice, coolers, paired seasonal fresh juices, garnishes, sparkling and still water, N/A beverages and a specialty non alcoholic cocktail. All of our bartenders are skillful, talented and experienced professionals who have a minimum of 5 years of bartending experience as well as RAMP certification. Our services require a minimum of one bartender per 50 people to ensure you and your guests have nothing less than a premium experience throughout your event. Our bartending services are contracted to arrive 2 hours prior to event for set up, and up to 5 hours of bartending service with additional clean up time after the event. 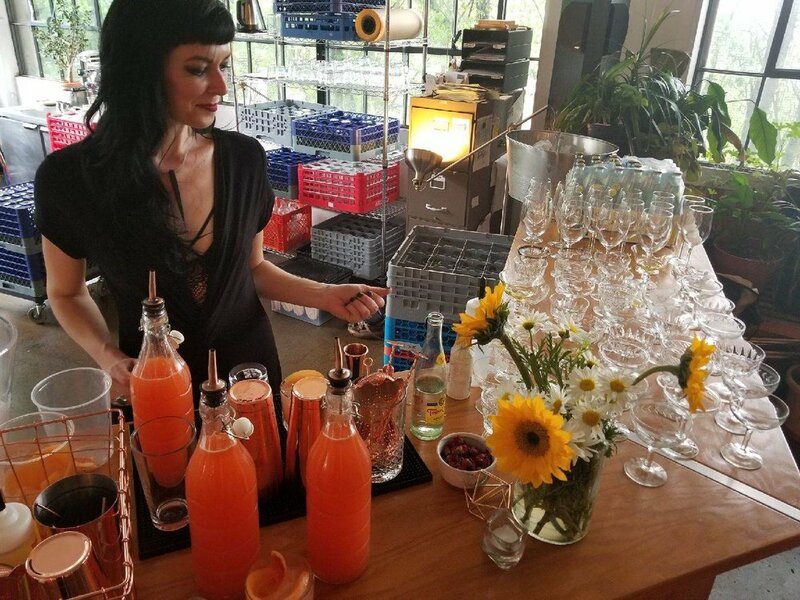 Let us create a truly unique experience for your event with one of a kind cocktails created from my seventeen years of crafting beverages. All of our cocktails are inspired by and use only fresh, seasonal ingredients. This service is available as an add on to any of our existing options. Everyone wants to be a part of the party and this is a great way to provide a beverage option for everyone. We make our mocktails with as much love as their boozy counterpart and only use fresh juices, house made shrubs and beautiful garnishes. Go ahead, be particular and get exactly what you want! With this option, we will work together to make the ultimate cocktail menu for your party! You tell us what you love and hate, and we show up and bring the tasting options prior to your event. Make that old fashioned on the ROCK. Add a two inch ice cube to upgrade any cocktail or prevent your bourbon from being diluted. Add an extra special touch to your party with cocktail napkins to match your theme or big day! Rent our signature vintage glassware for your event. All of our antique glassware is unique and makes every drink look even more beautiful. You’ll never lose your glass at a party again! Glassware is priced per glass, by the rack only. We offer a coup, wine, and lo ball glass. We love parties and fresh ideas! Not seeing what you're looking for? Fill out our contact form and we'll be in touch to find something that works for you!